'The Little Boat That Could' washes ashore in Scotland after traveling thousands of miles since January. Students from the Kennebunk High School Alternative Education program built “The Little Boat That Could” and launched it on Dec. 29 near Georges Bank. It washed up and was found in Scotland on Friday by John and Angelika Dawson while they were walking their dog. “The Little Boat That Could” has lived up to its name. After 168 days and 12 hours at sea, a small sailboat built by high school students in Kennebunk washed ashore in Scotland after traveling thousands of miles. The boat had sailed across the Atlantic, then up and down the coasts of Portugal, Spain and Ireland before it was discovered Friday by a pair of Canadian tourists exploring a beach on a remote Scottish island. “It really was a crazy journey,” said Leia Lowery, the director of education for the Kennebunk Conservation Trust who worked with the students who built the boat and documented its journey on Twitter. 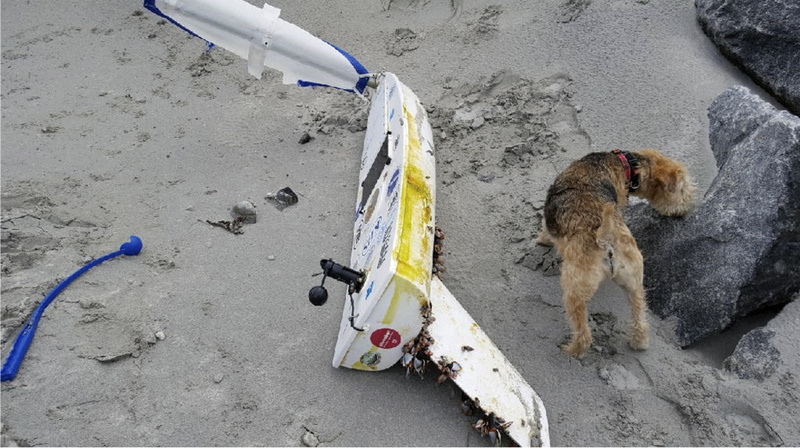 The 5-foot boat washed up on Balivanich Airport Beach on the island of Benbecula, where it was found Friday by John and Angelika Dawson of British Columbia as they were walking their dog. The couple notified local police, who called the Scottish coast guard. At first, no one quite knew what to make of the boat, which is covered with stickers from Maine groups and businesses. The blue and white sail is a bit tattered and the underside of the boat is covered in mussels, but the solar panel, camera and sensors appear to be undamaged. 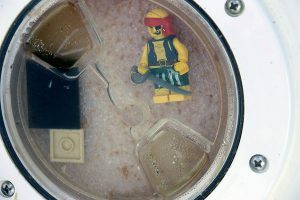 Even the tiny Lego pirate that had been the students’ mascot while they built the boat survived the journey intact. “Everyone was really excited to hear it was in pretty good shape,” said Ed Sharood, a teacher who worked with the students to build the boat and who informed them of its discovery via text message and email. Some students who had doubted the boat could make it were a bit surprised, he said. After determining the boat was not hazardous, the Scottish coast guard moved it to a secure location while officials tried to contact the owner, according to a Facebook post from the HM Coastguard Benbecula. In an update, the HM Coastguard Benbecula said the boat has been handed over to Mari Morrison, a primary school teacher from North Uist. Morrison had previously been involved with the rescue and repair of a similar mini boat that landed in Scotland in 2016. The boat project is part of an ongoing partnership between the students in the Kennebunk High School Alternative Education program and the Kennebunkport Conservation Trust. The trust bought the kit to make the boat from Belfast-based Educational Passages using an $1,800 grant from San Francisco-based RSF Social Finance. Even the Lego pirate on the boat launched by high school students in Kennebunk survived the transatlantic journey to Scotland. Seven students from the high school program teamed up with the trust and The Landing School in Arundel to construct the 5-foot self-steering boat that is powered solely by wind and currents. Inside the boat – named “The Little Boat That Could” by students – is a waterproof pod that includes a chip that should have collected data from the sensors, along with information about the alternative education program, Kennebunkport Conservation Trust and items that tell about life in Maine. Kristen Cofferen, one of the students working on the project, suggested the boat’s name after a classmate expressed skepticism that it would make it across an ocean. “We thought it would be a good opportunity to engage ourselves,” Cofferen said in December when the students were finishing up the project. Students in the alternative education program take classes for the first couple of hours each day, then spend the rest of the school day in the community working on projects and learning about career opportunities. There are seven students in the program, which launched in 2012 to serve kids who weren’t finding success in traditional classrooms. Students handed the boat over to Educational Passages on Dec. 29 and it was launched near Georges Bank on Jan. 2 by a fishing vessel from the Portland Fish Exchange. The students and their teacher tracked the boat on the Educational Passages website, following its progress as it initially made a beeline for Spain before veering south toward Morocco. It came within 100 miles of Portugal, then headed back out to sea. “We laughed and said we’re the only ones who would send out a boat that would boomerang right back home,” Lowery said. 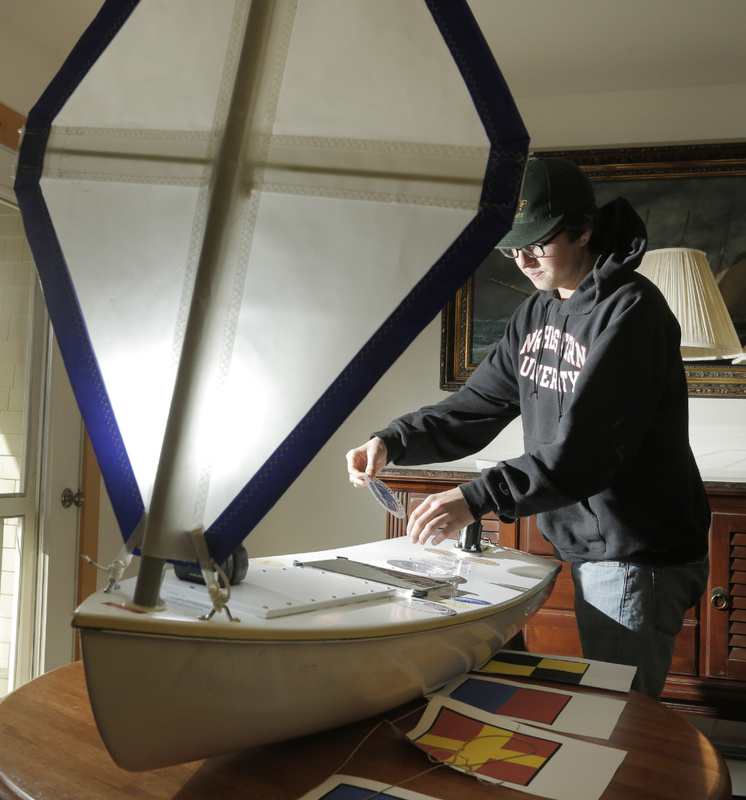 Senior David Patoine, a student in the Kennebunk High School Alternative Education program, applies a sticker from a local business on the boat in December. Students hoped it would reach Ireland. 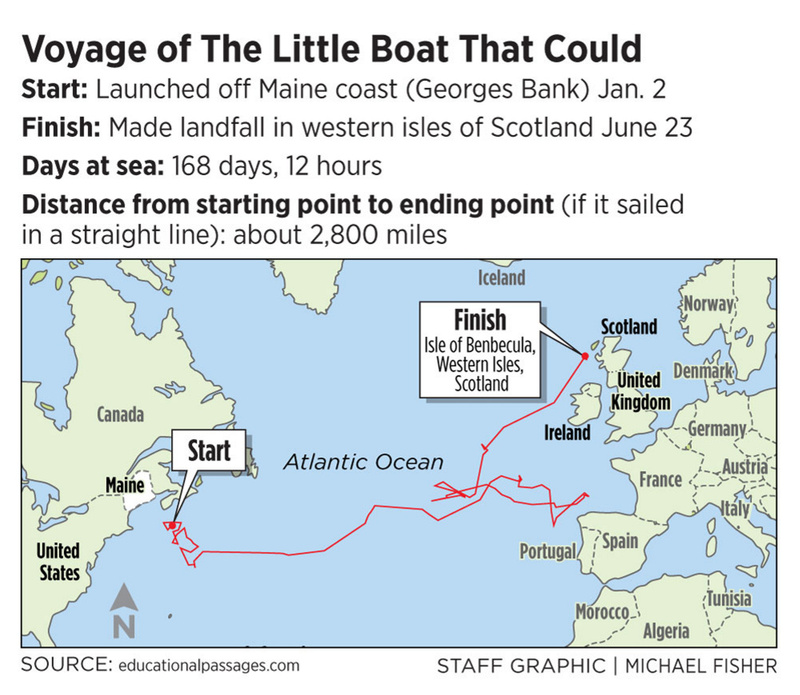 The Maine students had hoped their boat would make it to across the Atlantic and that they’d be able to connect with students in another country via Skype. Now that Sharood and Jacqui Holmes, the other teacher working with the students, are in touch with the Scottish teacher, they’re planning to make that happen. Sharood said Morrison’s students have been studying the ocean. During an assembly celebrating the last day of school Friday, Morrison plans to bring out “The Little Boat That Could” to show students. Sharood and Holmes plan to coordinate with Morrison to start a conversation between students in Maine and Scotland. Sharood thinks his students will have lots of questions about Scottish culture and life on Benbecula, an island off the west coast of Scotland with about 1,300 people. He said they’ll work with the Scottish teacher and students to retrieve the data and make repairs so “The Little Boat That Could” can be relaunched. Sharood and Lowery also are dreaming of finding a way to get the Kennebunk students to Scotland for a once-in-a-lifetime trip to learn about the island where their boat made landfall. More information about the path the boat traveled is available on the Educational Passages website.